I thought I'd write about variety: not the entertainment mix but the variety of fencing actions: something we, coaches, would love to see more of during the bouts. 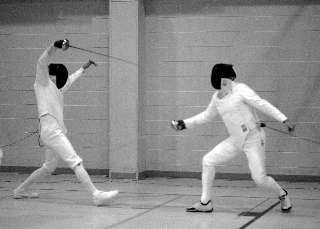 Unfortunately, what we often see are fencers who keep using the same action again and again, whether or not it is suitable in that particular moment. It might be a reoccurring attack or a repetitive parry, but almost always it makes their fencing predictable and ineffective. Things become even worse if the action itself is not executed very well. Let me illustrate this with an example. Think of Julian who started to fence just a few months ago (any resemblance to people you know is purely coincidental). Julian is quite sporty, he has good speed and a good long lunge. He enjoys attacking and often wins fights, particularly against slower and the shorter opponents. But sometimes they still beat him, especially if they are good with their parries. When Julian encounters a parry, he attacks faster trying to out-speed it. This usually doesn't work but Julian hopes that by building up the speed he'll eventually manage to solve this annoying issue. He will get through that parry! Julian also has difficulty with opponents who are taller or the same height as him. When he attacks, they often extend their arm out and hit him first. Again, he concludes that a faster and perhaps the more aggressive attack will solve this problem. Julian resolves to improve the speed of his attacks and when this doesn't help, he decides that maybe he's just not made for fencing. Yet, if Julian would get a coach to have a look at his fights, he'd learn that his speed was never the issue. He is just lacking some basic technique to counter his opponents' actions: the knowledge of how to draw and deceive a parry, or how to extend his arm correctly during his attack. These things are not very difficult to learn but they make a huge difference, and without a coach's advice, it's hard to realize what lies at the root of his failing actions. In order to progress Julian should turn to his coach or to the more experienced fencers for advice. Having identified the problem, he should then correct the errors and add the missing actions to this arsenal. Both of those things are best done during individual lessons. If you'd like to fence better, just doing a lot of practice bouts is not enough. For every fencer it's important to understand that learning new actions and improving the existing ones is the most crucial element of training. Without that the fencer becomes a one trick pony unable to adapt their game. Make a list of actions which you think you can do well and discuss them with your coach. Can these actions be further improved or developed? Are there situations when these actions won't be enough? Understand your weaknesses. Establish what important actions are missing from your arsenal, learn them with your coach and practice them during the bouts. You do not have to know every trick in the book. For example, it is perfectly fine to use just 3-4 parries rather than all nine of them. But those parries must be well executed and followed by a swift riposte (or a riposte with disengagement if needed). 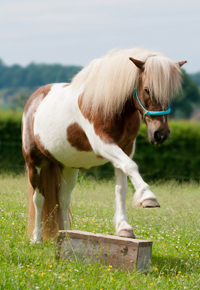 Learn new skills - do not stay a one trick pony!